In this week’s column, I examine an iTunes Match problem that happens to some people, where their music isn’t available from a Mac. I also look at two questions which can be resolved using AppleScripts: One about queueing playlists, and another about exporting playlists to listen to on a USB stick connected to a car stereo. Q: I have over 12,000 songs stored in iCloud with iTunes Match. For some reason, I cannot access them from my MacBook Pro. I can access all of them from my iOS devices, so I know they’re all still there. Is there any way I can fix this so I have access to iTunes Match on my laptop again? There are several things you can try; one of these might work for you. 1. First, try logging out of your account in the iTunes Store. On any page in the store, click on your Apple ID in the upper-left corner of the window, then click Sign Out. Quit and relaunch iTunes. If iTunes doesn’t ask you to sign into your account, click the Sign In button, which is in the same location as your Apple ID was just before. 2. If the first method doesn’t work, try turning off iTunes Match. In iTunes, go to the Store menu and choose Turn Off iTunes Match. Then, from the same menu, choose Turn On iTunes Match. iTunes will ask you if you want to add this computer to iTunes Match. Say yes, and let iTunes grind its gears for a while. 3. If neither of the above work, try turning off iTunes Match, logging out from your iTunes Store account, and then restart your Mac. Launch iTunes, sign in to your account, and turn on iTunes Match. Q: Is it possible to start playing a selected playlist once a current playlist has finished playing? Instead of having to manually select a new playlist, I’d like to set up a queue of playlists for long periods of uninterrupted music. Make sure your Queue playlist is sorted like this to have the playlists play in the order in which you add them. But I wondered if there was another way. I asked my friend Doug Adams, the AppleScript wizard, and he whipped up an AppleScript that can help you set up a playlist queue. Make Mega Playlist (free, donation requested), displays an interface with all your playlists. Click one to select it and then click Append. The AppleScript creates a new playlist called [-Mega Playlist>, and appends the contents of your selected playlist to it. Select another, click Append, and add those tracks to the Mega Playlist. Do this with as many playlists as you want. You can click Clear to delete all the tracks from the Mega Playlist and start over. You can play this playlist from iTunes, or you can sync it to your iOS device. 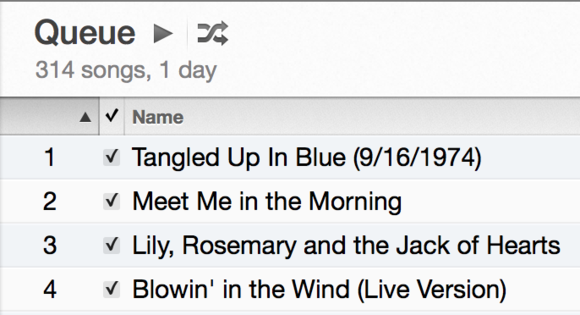 Queue up hours, even days of music with the Make Mega Playlist AppleScript. Q: I want to add some iTunes playlists to a USB stick to play in the car. I’ve exported playlists and copied songs, but while the car stereo sees the playlist, it says they are empty. 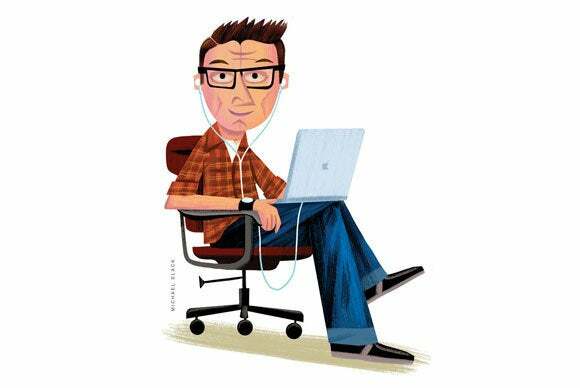 How can I get playlists—and songs—from iTunes to my USB stick to play in my car? Assuming your files are DRM-free—in other words, not songs purchased from iTunes in their older format, prior to April 7, 2009—then the problem might be the playlist format itself. Most devices like car stereos read playlists in .m3u format, and you’ll need to create playlists in that format. You can export playlists from iTunes in this format. To do so select a playlist and choose File > Library > Export Playlist, and select M3U from the Format menu. 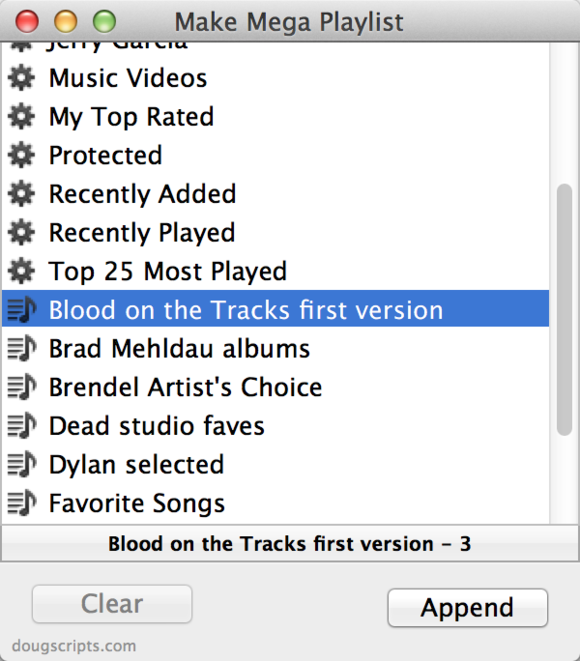 The problem is that when iTunes does this, it includes an absolute file path in the playlist. That file path is fine if the songs are still on your computer, but once you move them to the USB stick, the file path changes. But even that path is different for the car stereo, which sees it according to its own file system. To alleviate this problem, Doug Adams has written two AppleScripts that can do this. The first, Export Selected with M3U, exports selected tracks to a folder you choose and creates an M3U playlist. You can use this if you want to just export a bunch of songs and copy them all to the USB stick, without folders. 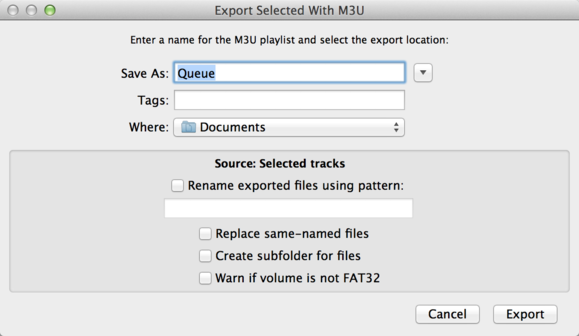 This AppleScript gives you many options for exporting files with an m3u playlist. The second, Make M3U Distribution Folder, creates folders for selected tracks or a selected playlist, together with .m3u files. This said, it’s entirely possible that your car stereo won’t understand these m3u playlists either as there are many variations. If this is the case, you should check online forums about your car or its stereo to find out how to export playlists.